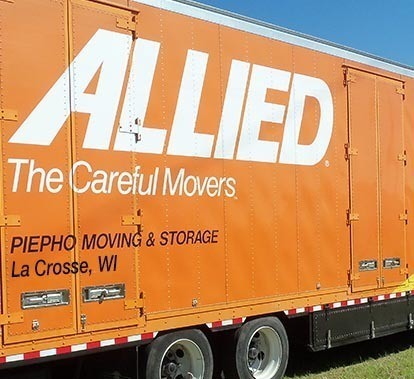 An Allied Van Lines agent with more than 60 years in the business, Piepho Moving & Storage has the experience and dedication to customer service that's made us the trusted mover in La Crosse, WI and beyond. Piepho is a family owned and run company offering full service residential and corporate moving and storage. Our professional and friendly La Crosse moving team has the experience to move your belongings safely and efficiently at a price that fits your budget. With our Piepho family name on every truck, you can be sure that we stand behind every move we make. 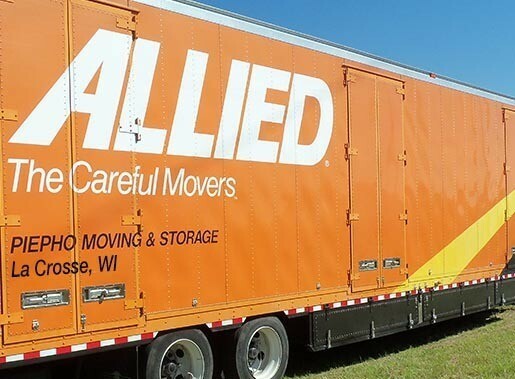 As your local agent for Allied Van Lines, Piepho Moving & Storage serves La Crosse, Vernon, Monroe, Jackson, Trempealeau, Eau Claire, Buffalo and surrounding counties. Affordable Hourly Rate — Customize your move to fit your budget. Have your La Crosse movers take care of only the big stuff, or leave everything to us. It's up to you. Great Customer Service — Whether you need your La Crosse movers to take a bedroom set to Sparta or your large furniture from Madison to Milwaulkee, WI, Piepho Moving &Storage has local moving options backed by award-winning customer service. Part of Your Community — Piepho Moving & Storage has been in your community for over 30 years since we opened our La Crosse moving office and storage facility in 1981. Proudly serving Onalaska, La Crosse, Winona, Tomah, Sparta, Viroqua, Black River Falls, Arcadia, Westby, Whitehall, and beyond. See Our Review — Piepho Moving and Storage is so proud of our reviews and overall customer service & satisfaction. Let us know what you think! As an Allied Van Lines agent, Piepho Moving & Storage is your local La Crosse mover with national and international reach. We're part of a network of nearly 500 Allied Van Lines agents across the United States and around the world. Wherever you need to go, we can help. Estimates — Our knowledgeable local La Crosse moving estimators will come to your home and explain how moving charges are calculated so you can choose the best options for your budget. Based on your needs and our review of your household items to be moved, we'll provide you with an accurate estimate. We'll never charge for in-home estimates, and we'll never ask for a deposit or down payment to book your move with us. Guaranteed Delivery Window — You want to know when to expect your belongings to arrive at your new home. When you book your long distance move through Piepho Moving & Storage, in most cases we'll provide you with a guaranteed delivery window. That means if your shipment hits an unexpected delay, we'll compensate you for the inconvenience. Your Personal Long Distance Relocation Coordinator — Your La Crosse moving coordinator is with you from start to finish helping you plan your move from the initial estimate until you’re unpacked at your new home. We’ll often hear that our move coordinators are the best stress-reducers anyone could hope for. We’re here for you 24/7 — Need help? Have a question you need answered on your schedule? You’ll have direct phone numbers to your driver and La Crosse moving coordinator. 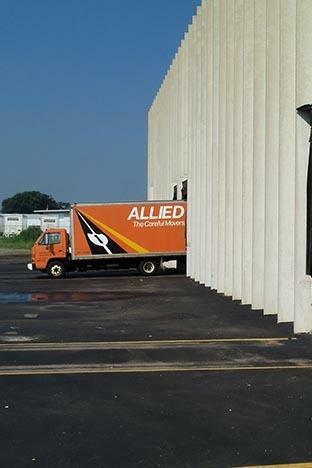 Track The Truck — Stay up to date on your truck’s progress using Allied Van Lines online shipment tracking service. Are you building a new home in western Wisconsin and need a safe place to store your possessions? Or are you running out of room for your items in your closets and utility room in Eau Claire? Contact Piepho Moving & Storage’s Onalaska, WI storage facility to learn more about how we keep your belongings safe at very reasonable rates. Secure Storage — Our first priority is keeping your household goods safe. Piepho Moving & Storage warehouse employees are background checked, and warehouse access is controlled at all times. Visitors are always accompanied by a Piepho warehouse employee. Climate Controlled — The Piepho Moving & Storage warehouse is temperature and humidity controlled so your belongings remain in great shape. 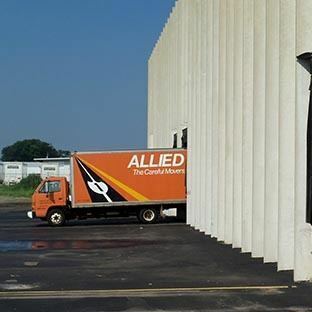 Coverage That Continues — When you have valuation through Allied Van Lines, your coverage extends to items we moved for you and store in our Onalaska, WI warehouse. Stop by our Onalaska, Wisconsin office and pick up the moving and packing supplies you need. Save time and effort by having our professionals pack your belongings. Most residences packed in one to two days. Have us pack all of your belongings, or choose the ones you want help with. Fagile items? No worries, we're experts at packing them safely. Maximize your available valuation coverage by using our experienced packers. Our relocation team works with companies in and around La Crosse County and the entire western Wisconsin area to provide employees like yours premier moving services. Our experienced La Crosse moving teams understand your employees need efficient and conscientious service. We do the heavy lifting, allowing your employees to keep focused on their work and their families. Best Drivers & Crews — As a corporate relocation client, your employees are assigned our most highly rated La Crosse movers and drivers. Custom Moving Plans — Choose from options in services and pricing to create your best custom moving plan that meets your needs and your budget. Pricing without seasonal fluctuations is available to our corporate clients. Peace of Mind, No Extra Charge — Most moves qualify for free valuation coverage. Available For You — Need to schedule a move last minute? No problem. We keep our La Crosse moving teams available for your employees even during our busy summer months. Full Service Relocation — Mortgage and realty assistance thanks to our partnership with Allied Van Lines SIRVA. When it's time to move your office or business, you need to minimize the impact on your operations. That's why our La Crosse movers will work outside your business hours to keep you up and running. Our La Crosse moving crews are highly efficient, and have deep experience moving offices, schools, medical equipment, computers, and other sensitive machinery. Reliable Estimates — We visit your workplace and review your unique needs to create an acurate estimate. Personal Move Coordinator — Our La Crosse moving coordinators assist with your move from start to finish and are always available to answer questions and help problem solve whenever you need them. 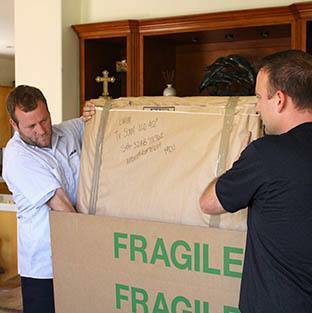 Safe Transport — To protect your furnishings during the move, we use a variety of materials including blankets or shrink wrap. 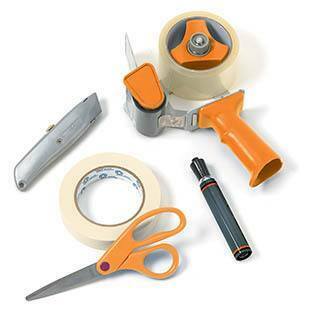 We’ll also take apart office furniture as necessary, and reassemble at your new location. Your La Crosse moving team knows how to protect fragile equipment such as computers, copy machines, phone systems, and more. Storage That Delivers — We take the hassle out of scheduling various deliveries to your new space. Our Onalaska warehouse can receive new office furnishings and business equipment, store it in our secure and climate controlled facility, and deliver everything on the schedule that works best for you. Or, if your new space isn’t available at the time of your move-out date, we can store everything until your new space is ready. 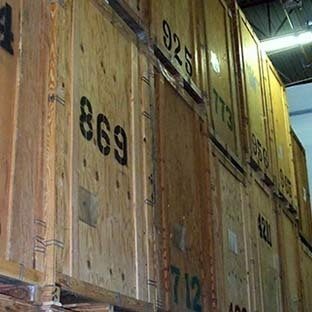 Whether you've run out of on-site storage, or need more security for your sensitive records, our Onalaska WI warehouse facility is for you. Built to exacting safety standards for security, durability, and strength, the Piepho storage warehouse is also easy to reach located just off interstate 90 and highway 53. All Piepho warehouse employees have passed strict background checks. Storage facility access is limited to Piepho warehouse employees. Visitors are with a Piepho employee at all times. Because our warehouse is temperature and humidity controlled, your paper and electronic records will stay in tip-top shape for the long haul. An independent reviewer retained by Allied Van Lines, Telesight, rates Allied agents on their customer service. Piepho Moving & Storage has earned the top rating for customer service for more than ten years in a row and was recognized by Alled with a prestigious award, The Apex Award. This honor goes to only a handful of the very best Allied Van Lines agents. 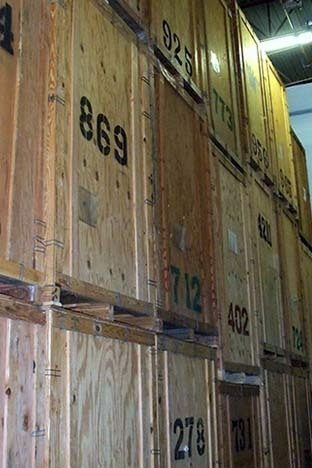 We've been in the business of moving & storage for over six decades. In 1952 when Earl Piepho first opened Piepho Moving & Storage, he began a culture of service and reliability that we proudly carry on today. 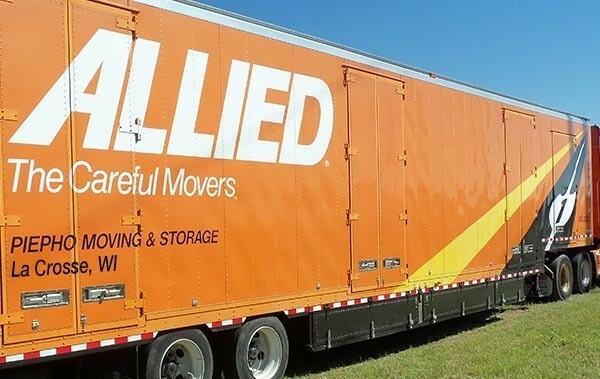 With our family name on every truck, you can rest assured we stand behind every move we make. Our experienced estimators come to your home to personally review your moving needs, and then offer you the best rate possible. In fact, if you find a better comparable quote, we'll beat it. Not only is our in-home estimate free, we never ask for money to book your move. No deposits, no down payments, and great rates. That's a winning combination. Serving: Onalaska, La Crosse, Winona, Tomah, Sparta, Viroqua, Black River Falls, Arcadia, Westby, Whitehall, and the rest of western Wisconsin.